State law proscribes that early voting must end on the Friday before Election Day, but allows for emergency voting. It is the conditional terms in the statutes surrounding the emergency voting which has led to the dispute between the GOP and Fontes. In the Sunday letter, the GOP asked the recorders to "identify and segregate" all of the ballots which had been cast at the emergency voting centers, of which there were believed to be about 3,000 in Maricopa County. Lines claims Fontes ignored the request and mixed the emergency voting ballots and the rest of the ballots together. At the time, Fontes would not confirm to the Republic if it had segregated the two kinds of ballots, but also told the paper it would be "nearly impossible" for him to do what the GOP was requesting. 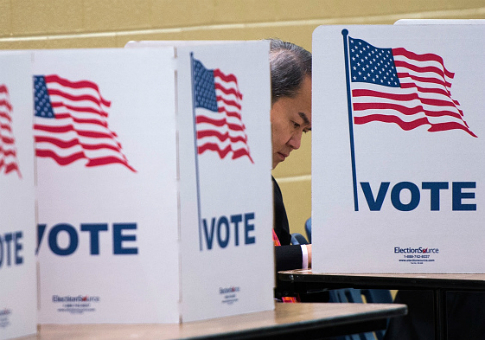 The Republic‘s report also said it was the first year the Maricopa Recorder's Office had offered the emergency voting centers, but also noted that many counties had offered extra polling hours "for years." "Adrian Fontes intentionally put himself above the law and the judicial process," Lines said in the release. "Such a man cannot be trusted to administer elections in Arizona. We are reviewing all legal options at this time and will continue to protect the rights of every legal voter in Arizona." A request for comment from the Maricopa Recorder's Office was not returned at the time of publication. Thursday's lawsuit by the four GOP county divisions claimed that some counties were still processing and "curing" some mail-in ballots for which the signature was flagged for not being an exact match, while other counties had halted the curing process. The suit asked a judge to impose a "uniform deadline" for those ballots, and a hearing is slated for Friday afternoon. 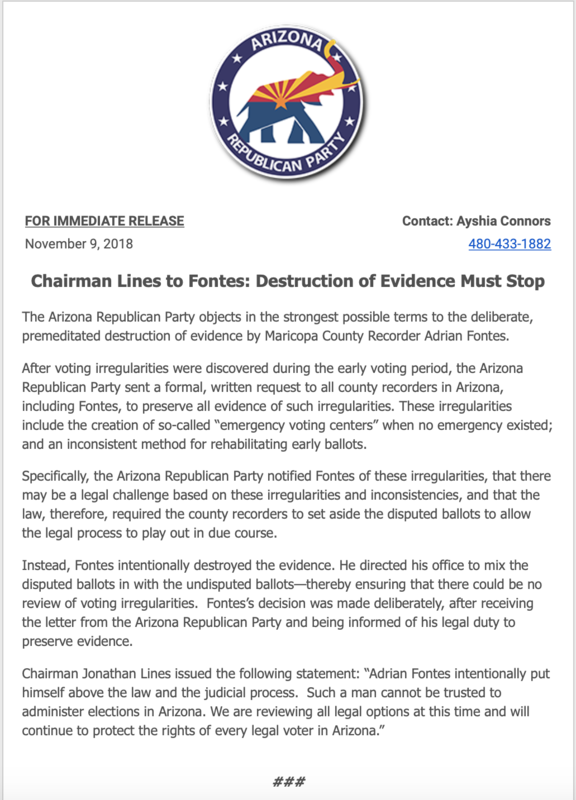 According to Associated Press reporter Nick Riccardi, the GOP suit over the signature-flagged ballots could affect 5,600 ballots in Maricopa County, and Lines claims they asked Fontes to segregate these ballots for future examination if needed. A press release by the Pima County Recorder's Office said it would begin voter verification for about 18,300 ballots beginning on Friday morning, and continuing in to Saturday, but it's unclear if any of those would also be affected by the pending suit. With both the Sunday letter by the GOP and the Thursday lawsuit, Democrats say Republicans are trying to suppress the vote. "If they really thought this was illegal conduct, they should have or would have gone to court much earlier," an attorney associated with Sinema was quoted as saying by the Republic. "But they're waiting for the 11th hour and they're trying to set up a challenge to a policy that's been in place for decades, and only based on whether or not they can gain an advantage on it." Republicans maintain that it is only Maricopa and a couple of other Democrat-leaning counties which have continued to cure the signature-flagged ballots, and that they would accept Maricopa's count provided all other counties follow suit. "Every single lawful vote in Arizona should be counted," Republican senator Jon Kyl said in a statement. "And voting laws in our state should be applied uniformly across the map. Unfortunately, the Democrats' legal strategy sounds an awful lot like an effort to disenfranchise voters from 11 counties from rural parts of our state and that's troubling." Kyl, who was previously a senator for the state, was appointed to the position again by Governor Doug Ducey (R.) after the death of long-time Arizona senator John McCain (R.). No matter the outcome of the Arizona Senate race, Republicans will maintain control of the upper chamber. UPDATE 4:45 p.m.: Friday afternoon, local NBC reporter Brahm Resnik reported that an attorney for Maricopa County told a judge a settlement had been reached with the GOP county parties which had filed suit, and all counties in the state will be allowed to "cure" signature-challenged ballots. Curing means in instances where the signature is not an exact match, the recorder's office may call the voter to confirm their ballot. The net effect of the GOP lawsuit, therefore, does not appear to block any votes in Maricopa County, and should expand the overall number of votes counted statewide. This entry was posted in Politics and tagged 2018 Election, Arizona, Kyrsten Sinema, Martha McSally. Bookmark the permalink.